When I speak about using iPads in a primary school classroom, I am often asked about how it would work if I only had one iPad as is the case in many classrooms. This post is the first of what I hope will be several with suggestions as to how to make that work effectively. Although my classroom is one to one with iPads, I have many high quality book apps on my own iPad that I did not choose to put on the thirty iPads I have in the Volume Purchase Plan account for the student iPads. Sharing these apps with my students puts me in a similar situation to a one iPad classroom. This can work for Internet sites as well as apps. One of my new favourite sites is Unite for Literacy, a webpage with over one hundred eBooks for beginning readers. Each page has the option of having the text read aloud and it works on iPads as well as computers. This would also be an appropriate option for a small group of early readers. 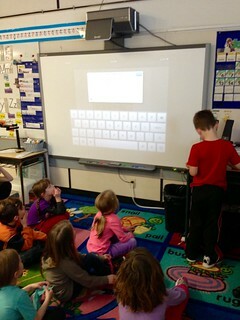 When I use my iPad for my students to listen, I put the iPad onto our DEWEY document camera stand. The iPad could also be on the floor (which is what I used to do), but the students prefer to have the it raised since we have that option. 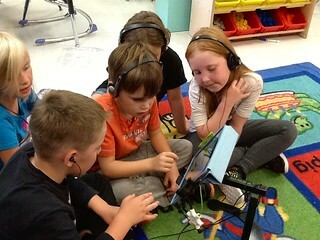 One iPad, five students listening to high quality reading. Hello Mrs. Cassidy! 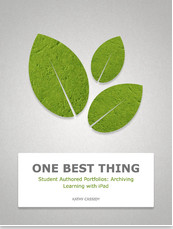 This blog post really stood out to me because I had always wondered how one could best use a limited number of iPads in a room full of students. I have known of devices that would allow two listeners at once but I have never seen anything that allows as many listeners as the Belkin Rockstar. I can use this in my future classroom as well as with my boys at home. Very Cool! 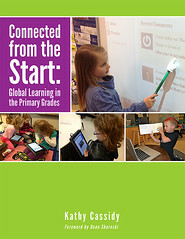 Pingback: Blogging in a Primary Classroom–With Only One iPad! Thank you for taking the time to offer a valuable tip in implementing the use of ONE Ipad in the classroom for a whole group setting. As a teacher I only have one Ipad and seeing this idea really gives me hope in using mine in my classroom. Thank you and continue with your fresh and new ideas. Much to be thankful! I love this! Thank you for blogging about having only one technology piece! I have 4 student computers that are difficult to navigate with kindergarteners. We have two websites to use and we do regularly but outside of those two staples, we don’t have much! I have ONE “iPod” which is actually my old iPhone 4. They LOVE it! I never even thought to get a headset “splitter” to allow more than one student to listen at a time. That iPod is a hot commodity and can regularly be the cause of an argument! I’ve been considering how to use an iPad in the classroom and how to eliminate the arguing. I went throughout Donor’s Choose for some classroom supplies and this is going to be my first big ticket item to ask for. I am so glad I came across your blog here to give me some ideas for how to implement its use!! Glad I could help, Stacey!